We are extremely proud to shout about our recent starring role in The Metro, featuring our bespoke furniture project for television weather presenter, Clare Nasir and her husband BBC Radio 6 Music DJ, Chris Hawkins. 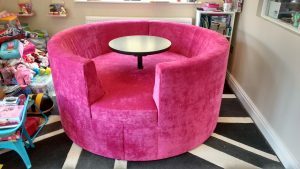 Their furniture fantasy was turned into a reality when we created a quality bespoke circular sofa for their daughter’s bedroom, in Wilmslow, Cheshire. Clare and Chris wanted to create a bespoke circular sofa with a table in the centre for their daughter’s bedroom so her and her friends could play and enjoy meals together. They decided on a bright fuchsia fabric, to fit in with the current decor of the interior, from the brand Christina Marrone, to ensure the piece made a strong and fun statement in the room. 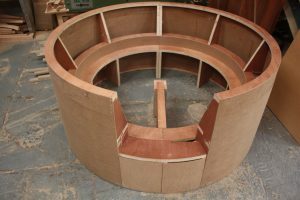 The process of creating the circular sofa. When creating this bespoke piece, we wanted to ensure it was safe for children, so we produced an almost full circle with a small gap in the centre for them to climb into and out of, therefore reducing the risk of them falling off. 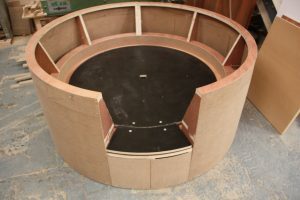 The centre table is also removable so they can play on it or eat/colour using the table! To find out more about Clare and Chris’s interior design project in their Cheshire home, you can read this article from The Metro, featuring our circular sofa.